The responsibility for the protests in Brussels should be shared between the EU Commission and each of the governments, French economist Jacques Sapir told RT. RT:We are seeing aprotestat the very heart of the EU. How hard must it be for the people that they are driven to such measures? Jacques Sapir: The European Commission sets rules to reduce the budget deficit in a lot of countries. But it is the government of each country which is implementing these cuts in budget in France, Italy or like right now - in Belgium. I think that the burden is to be shared between the EU Commission and each government. RT:The Belgium authorities should take the measures according to the EU regulations. Do you think there is any other way they could be dealing with this problem? JS: The main issue is the fact that the whole EU, and particularly the eurozone, is in a state of depression. We have huge unemployment in a lot of countries like Spain, Portugal, Greece, even Italy and France. We have price inflation which is going down right now in a lot of countries. It is creating a very, very difficult situation. On top of that there is the main problem: why Germany is not pulling up the whole European economy? Maybe Germany could not do that. That is absolutely possible, but if it is so then there is a big question on the future of the eurozone. 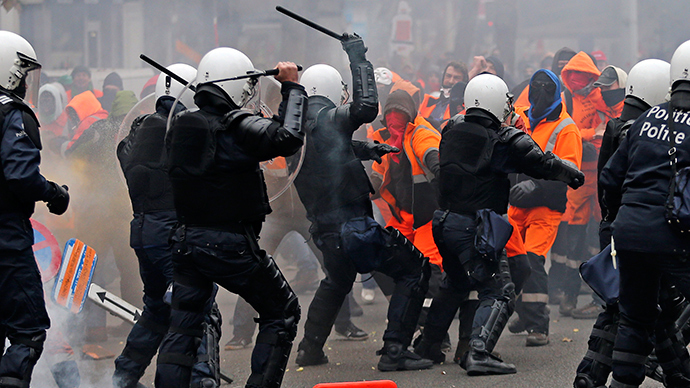 RT:The protest in Brussels had a very harsh police reaction. Is such a heavy-handed response by the authorities in any way justified? JS: Definitely not. We already had this problem in France, when a young man got killed [in clashes with police over] the construction of the Sivens Dam. We know that he has been killed by a grenade thrown by the police force, the gendarmerie. We had a lot of other incidents: in Brussels, a very harsh incident in Spain some time ago and in Italy. There is a general trend of police using harsher and harsher measures to crush demonstrations. These things are extremely hard for people because they have been more or less free to demonstrate for the last 20 or 25 years. Right now there is an understanding that rules of the game have changed and that government is to repress and to suppress this kind of demonstrations. RT:There is a whole month of protest planned by Belgian workers. What do you think, can they succeed? JS: The problem in Belgium is the fact that the whole country is very weak. There is of course a very big divide between French speaking Belgium and Flemish speaking Belgium. There is also an economic divide because the Flemish part of the country is far better off than the French speaking part. It is a very, very complex issue. As a matter of fact, a large number of demonstrators in Brussels come from the French speaking part of the country [and] the demonstration is turning into a kind of opposition between the Flemish and the French speaking parts.